What do you do when you want to eat on the cheap? Well what you should do is cook at home, but for arguments sake let's say you needed to find somewhere to grab takeout? Here's what I've been doing at least once a week for the past few weeks. 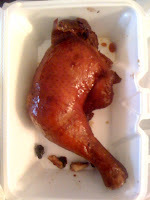 I go to Chinatown and get a couple of BBQ roasted chicken legs as takeout and eat that along with a salad that I make at home. 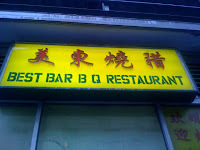 Hong Kong Eatery (here) does a great job on all of their bbq. BBQ chicken legs are $2.50 a piece. They're marinated with a sweet and salty almost molasses-type glaze that is really tasty. I recently tried a different BBQ place on the outskirts of Chinatown (on Beach St, in that area between Chinatown and South Station past Surface Road) that has been pretty good as well. 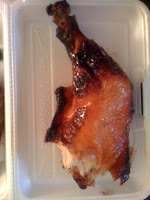 There, they also have soy sauce chicken legs in addition to the roasted ones. Even better news, they're $2.25 each. I snapped some pics in case anyone wants to give it a try. Go early because they usually sell out of the chicken legs by 6-7pm. Oh and please pardon the bite marks on one of the chicken legs. I was starving and forgot I was going to take pics to post here. 1 Response to "Cheap Eats in Chinatown"